The Schooling Bannerfish, also known as False Moorish Idol, or Pennant Butterflyfish has a very elongated white dorsal filament. It has a base colour of white with two wide black stripes. The soft dorsal and caudal fins are yellow, pelvic fin is black and there are black marks above the eyes and top of snout. 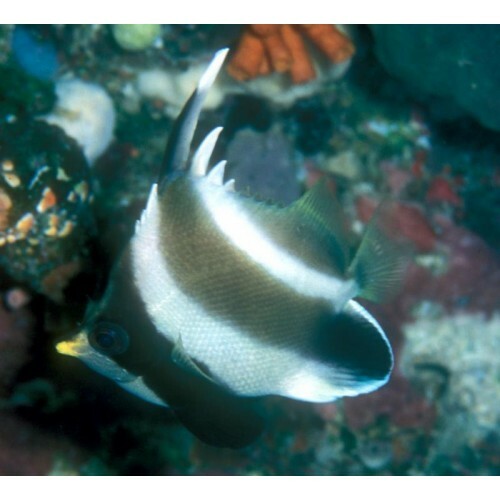 The Schooling Bannerfish are almost identical to the Black & White Heniochus Butterflyfish Heniochus acuminatus. The most distinguishing feature of the Schooling Bannerfish Heniochus diphreutes is its rounder breast and less protruding snout. Schooling Bannerfish are also planktonivores and are reef safe. Members of the Heniochus genera are often called Bannerfish instead of Butterflyfish.